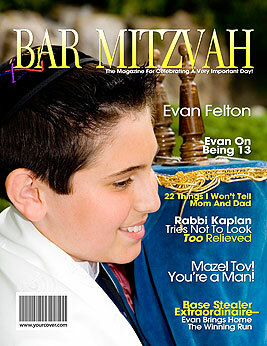 Celebrate the young man's achievement with a starring role on his very own personalized Bar Mitzvah magazine cover. A unique gift featuring his photo and custom headlines all about this milestone accomplishment. Looking for a special bar mitzvah gift that helps to celebrate and commemorate this important religious milestone in a child’s life? Create a unique bar mitzvah gift that everyone will appreciate for years to come – a personalized magazine cover starring the bar mitzvah boy. Use the magazine cover generator to upload a photo of the young man to the fake magazine cover template; then personalize each headline to reflect the importance of this occasion. Include the name of the temple, family members, the date of the bar mitzvah, even the rabbi’s and cantor’s names plus there is room for special memories about the child that will lock this moment in time for a truly unique bar mitzvah gift that will be looked upon fondly in future years. The magazine cover generator also provides default headlines for you to customize as well as a library of suggestions so that your fake magazine cover reflects the child’s likes, dislikes and true life story. The unique back cover feature is available just in case you have more photos and info than can fit on the front. When you are done you will have created a personalized bar mitzvah gift that will be enjoyed for years to come. In a hurry and need a last minute gift? Just upload your photo, personalize the headlines and you are done. Simply purchase the downloadable photo file for an instant gift that you can print at home. Or let us print your personalized magazine cover for you; we also offer frames, posters, mugs and other accessories as well as a gift service, rush shipping and international shipping. The best personalized bar mitzvah gift idea is a fake magazine cover from YourCover – a gift as unique as the recipient!